Tons of used computers from the West end up in Ghana. 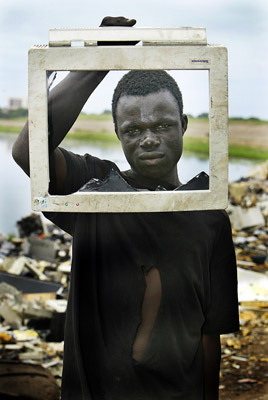 I visited the Agbogbloshie waste dump where young kids burn off the computers and other IT waste to get hold of the metals inside. Children as young as five years work on the site - burning PVC and plastics all day. Inhaling the fumes causes many health problems. Several children on the e-waste site cough blood after working too long in the toxic fumes.